I wonder if Milk Gallery has a mailing list of all the beautiful, well-dressed young art people in New York because the space was brimming with them Tuesday night at the gallery opening for the Dennis Stock exhibition. I looked at these creatures in their unironic cat fedoras (a fedora with ears woven into the fabric, naturally), their plastic black pants, their face harnesses and their lace tops and I was sort of dazzled by their “it-ness”, I’ll call it. It was just such a New York experience for me, an entire room filled with young people in various shades of black and beard and plaid. I almost felt like I was of a different planet, a creature in my own right who had just touched down in Planet Art Scene—I was just there to see the work of one of my favorite photographers. The Dennis Stock exhibition is on display at Milk until April 17, and features some of his lesser known works in conjunction with some more iconic pieces. Though I grew up looking at a photo of his over the fireplace in my family’s home and found myself casually studying his work on and off throughout my life, I never realized until that night how much of myself I saw in his work. Stock is also about moments, as I am—tiny little glimmers of soul that peek out when people least expect to be baring themselves. His photographs of celebrities are powerful for this reason: when they are with Dennis Stock, they are not “Insert Name Here,” they are just themselves. I hope, anyway, for the sake of the truth that appears in the photographs. I love the grain, the grittiness and perfection of a technically imperfect image, something I also try to do and find in my own work. To see even that he has taken pictures in the same way I have (or I in the same way he has), was an exciting, encouraging prospect. As if to say yes, you’re on the right track! Carry on. Because such is the nature of the gallery opening, I also got to meet the curator and one of the printers of the photographs and get lost in a discussion about photography which, sadly, I don’t get to do as much as I like. I felt kindred spirits among me and my inner light flickered anew. Shortly after I left with the feeling that the universe brought me here tonight for a reason, one of my favorite feelings on the planet, Planet Art Scene or otherwise. This brings us to a display of a different kind. 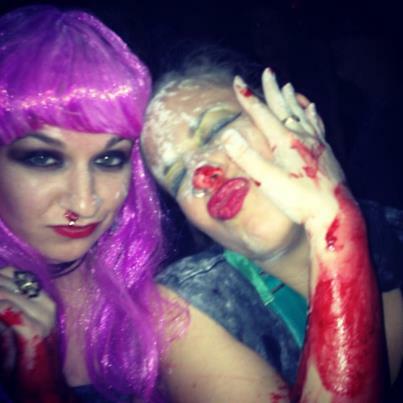 Last night I was covered in blood and cocaine. The fake kinds, of course—the sticky stuff that comes in a bottle and what I think was confectioner’s sugar. Remember that time you accidentally took a disco nap for 30 years, woke up with a beard, your lover was dead, the most famous artist you knew had transformed into a mannequin, and NYC had turned into a luxury shopping mall? We sure do. Decked out in our art punk drag, Rago and I headed to the Music Hall of Williamsburg in Brooklyn to dance ourselves into a frenzy, as the performance art troupe hopes all will do at their parties (to read about a previous Miss M+CHERYL experience, click here!). It was Rago’s first CHERYL, and she had no idea what to expect but put on a brave face and a bright purple wig and got into the thick of things with me like a champ. Reels of silver plastic floated throughout the crowd, star glitter was thrown from the stage onto everything and everyone, baggies of “cocaine” were ripped open and tossed onto the crowd, and the signature CHERYL fake blood was dripped onto arms and faces of willing participants (myself included). At one point the blood was so sticky I was putting the cocaine on it to make it less so. Then I slipped in some fake blood and stood up, only to be covered in more blood, cocaine, and now glitter—was this what the early ‘80s was like? Rago and I danced to Thriller, to Call Me Maybe, to Azealia Banks’s deliciously dirty 212, to Deee-Lite’s Groove is in the Heart. Revelry continued with a giant parachute floating over the crowd and making waves. For a heartbeat we were club kids lost in another decade and it was, as always, a perfect CHERYL evening.